NEW ORLEANS – The U.S. Track & Field and Cross Country Coaches Association (USTFCCCA) announced Tuesday the six coaches who will be inducted into the USTFCCCA Coaches Hall of Fame as part of the Class of 2018. Dr. Artis Davenport, Karen Dennis, Ron Mann, Damon Martin, John McNichols and Dan Pfaff will be enshrined in the Coaches Hall of Fame, for not only their incredible and historic accomplishments as cross country and/or track & field coaches, but also the long-lasting impact their contributions have had and will continue to have on the sports they coached. These six coaches will be honored at the 2018 USTFCCCA Hall of Fame Induction Ceremony on Tuesday, December 18, at the USTFCCCA Convention in San Antonio, Texas at the JW Marriott San Antonio Hill Country Resort & Spa. Started in 1995, the USTFCCCA Coaches Hall of Fame exists to recognize coaches who have brought great distinction to themselves, to their institutions and to the sports of cross country and track & field. 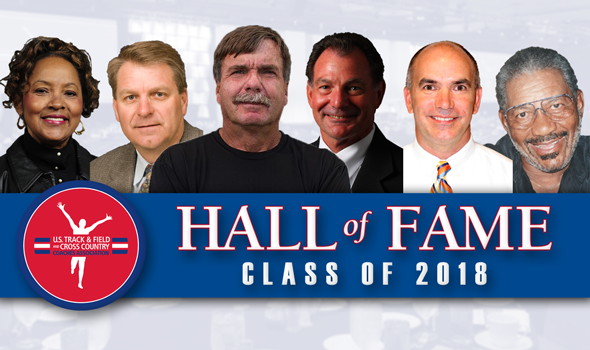 Each of the honorees exemplifies the qualities of dedication to the sport, leadership and passion for their profession and serves as an inspiration to coaches everywhere.